Canada is a global leader in aerospace and Manitoba is home to Canada’s third largest aerospace industry. Our highly competitive aerospace sector has been providing world-class products and services for customers around the world for more than 75 years. More than 5,300 Manitobans generate more than $1.3B in aerospace goods and services each year, over 80% of which are exported. Each year, during Aerospace Week, we celebrate the success and the future of our industry. It keeps the world moving, provides rewarding careers for our community and helps build a strong economy. 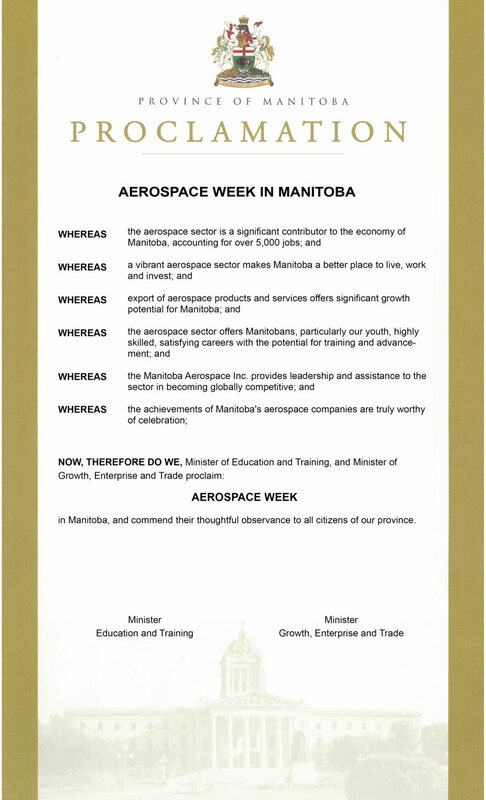 Starting with the Minister’s proclamation at Aerospace and Aviation in Manitoba (AAIiM) Day, the week includes a range of activities to celebrate the industry, inform and engage the public, and encourage students to study Science, Technology Engineering and Maths (STEM) subjects.